great shot and lovely graining. An excellent POV and an overall strong and elemental image...The tree of life here. Memorable image. Fabulous work, both by you and by nature !! WOW!!! What a picture! Gorgeous composition, gorgeous everything here. My favorite of the Roots, although I love them all! it's this a cotton tree? i like very much it! i seen two cotton trees in jamaica but i didn't find great crops... your is fantastic! very good bw tones and perspective! Wow!! brilliant capture Moises. very impressive details. excellent texture. and magnificent low angle. Beautiful composition, looks great in B&W. I,m impressed by the thick roots spreading all over the ground. Well done! wow!! excellent. i love the bottom half of the photo - i can't stop looking at it. thank you! Great contrast and highlight. Wonderful perspective shoot. Simply deserved the award!!!!!!!!!!!! A beautiful picture. I really like the centered composition. It just increases the strength of the tree. Wonderful picture. Don. This series is splendid, and it's hard to choose between them. I think perhaps I like this one best... Unusual and very powerful composition and magnificent B&W tones--the full range of them. Viva Velvia! This joins many of your other beautiful B&W photos in my favourites. powerful image my friend.. wonderful texture and b/w, the use of positive film have increase absolutely the transformayioon in b/w! magic saturation created and details on he root..
congrats for the award, double award very wel deserved it!!! Thank you for your comments, my experience is that it is much better to scan positives than film and it is much better to control the grey scales in PS with an original in color, you can control the highlights and the shadows more acurate for every part of the image, the positives are the closer thing from digital I have learn it from professional labs. 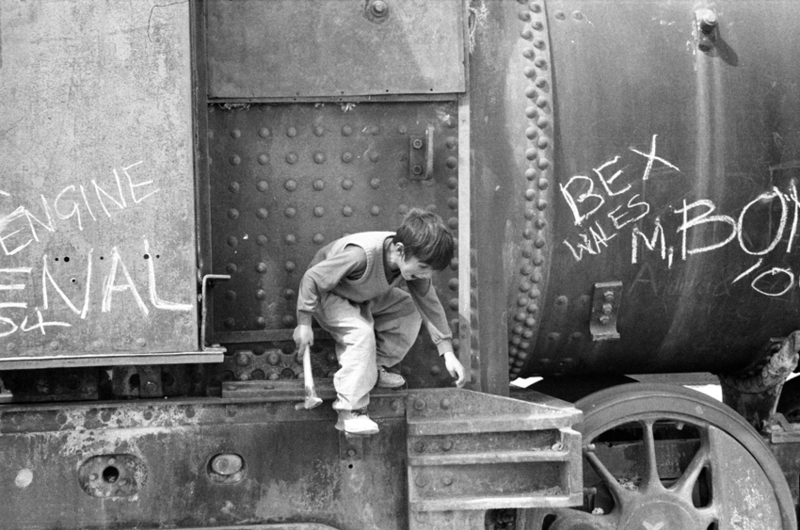 Excellent photograph. You transformed the real to surreal. Great use of the squarred frame. My only objection is as long as you shoot film you should not convert velvia to b/w in photoshop, you should shoot in b/w film, it would also look much better. 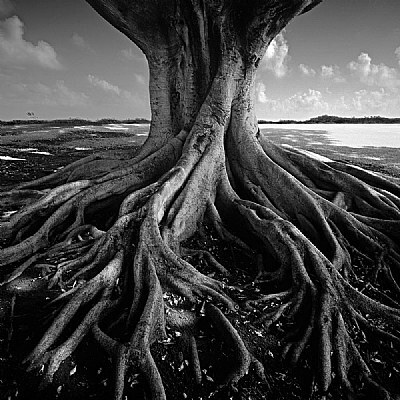 Wonderful b/w image, with the spreading roots from the trunk to the edges of the frame. I find the sky and clouds, usually my favourite conditions, slightly distracting from the beautiful b/w tones of the roots, but that's a bit of a nit pick! great composition, wonderful b&w..well done!!! Very nice. It's a shame the background isn't a little more interesting but it doesn't detract too much from the stunning roots. ALL YOUR PICTURES ARE PERFECT. THIS IS ECELLENT. can you help me in b&w pictures, in your pictures there is all gray(grey) scale. Do you use zone mode? I'm an italian student and I'm amatour but with my pictures on wall I'm happy but aren't perfect like yours, your b&w pictures are my favourites in web. my compliments. You are my teacher.... y intiendo bien espagnol pero perdoname engles?.?.? I very much like the bold, centeredness of the composition. I've also benefited by looking at the other two images of this subject in your excellent portfolio. It's interesting to see how you've "worked" the subject to produce three distinct moods. I especially like that you've included the tree beginning to sweep wider at the top of the frame. It gives the tree command o f the sky as well as the earth. The sense of sturdy upright great age is excellent in the present image. I wonder if you've considered evening out the tonality on the horizon on both sides of the tree. It would be interesting to see how it would effect the mood here. Great work in a wonderful portfolio. i like above all the composition,great shot!!! First of all, I really like these; the tonal range is awesome, as is the contrast and the basically simple theme, creating an elaborate line play, using light and textures to sketch an atmosphere. Even though the centered and rather bold composition in this photo works well, I do find the other, more extreme composition of the alternative you posted just a tad stronger. I guess that's a personal preference in off centered compositions, and I need to add, that this is on of the exeptions where the bold, centered composition is very appropriate and doesn't create a static image. I love the contrast and the composition. Great work! super super :) I like it so much :) ! One of the best photo i have seen today,captured and composed so well,detail,light,contrast and image treatment is excellent.and finaly this image need a award.Congratulation. it's a very well submit as composition study and the symmetery mood the roots and the tree makes. your composition is harmonic and so carefully, you have used 2/3 for the roots( to emphasize and attend it as the main subject) and 1/3 for the tree and background. the other good element in this shot is using BW expose that's helpful to enhance the "Form" in this shot.